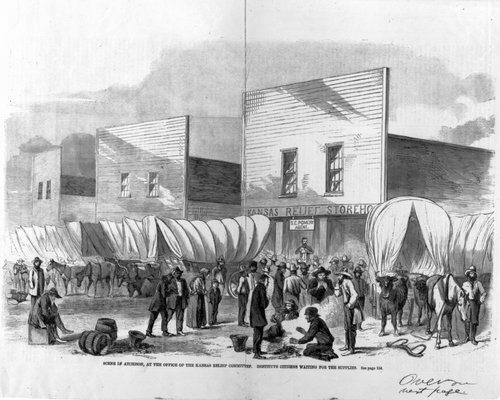 This illustration was copied from the New York Illustrated News showing destitute settlers waiting for supplies at the Kansas Relief Committee storehouse in Atchison, Kansas. The territory experienced a long period of drought from June 1859 through November 1860. As a result, settlers in rural areas suffered the most. With failed crops and limited supplies, thousands of people left the territory and returned to the East. S. C. Pomeroy was the agent for the relief committee.